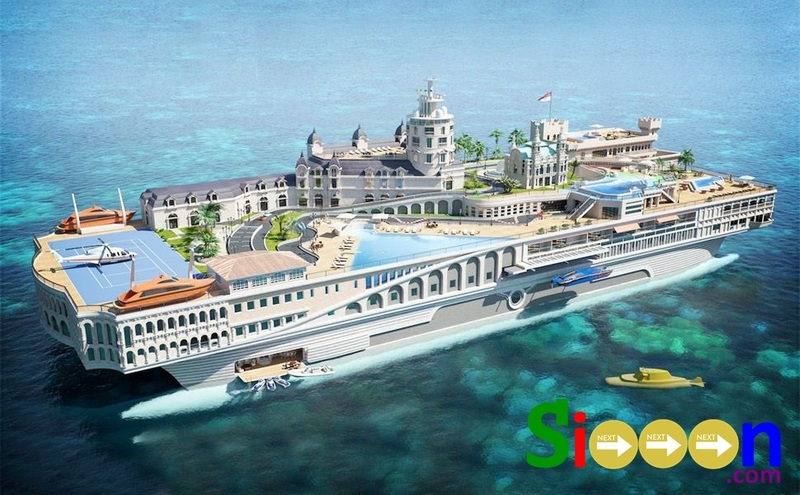 If previously discussed the World's Largest Sea Ship, this time Next Siooon will discuss about the most luxurious cruise ship in the world. Not only hotels or houses that have luxury with facilities in it. Now many Cruise Ships have many facilities and look very luxurious because it will make it comfortable for anyone to ride it. 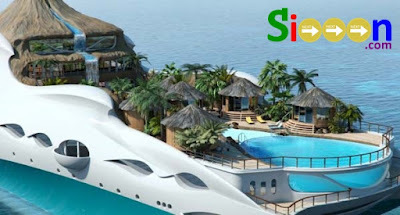 Sailing using a luxury Cruise Ship makes a pleasant trip with beautiful views of the sea you also get facilities like being in a Hotel. The difference is you are like in a hotel that runs on the sea. Various facilities such as Restorean, Swimming Pool, Cinemas, Billiards, and so on are available in the Marine Ships. First there is the Streets of Monaco is a cruise ship that has super luxury facilities, such as the Hotel de Paris, Monaco Palace of Work, even a replica of some Monaco buildings. The unique facility of the Ship Streets of Monaco is the Go Kart circuit. In addition, on this cruise there are mini submarines, swimming pools, tennis courts, mini waterfalls, underwater views to theaters. All in the ship looks very luxurious because it has a very good design, being one of the best cruise ships in the world. This cruise ship offers beautiful and beautiful scenery, inside the ship there are parks, artificial forests and hilltops. Anyone who boarded this cruise ship did not feel that he was on a cruise ship but felt like he was on vacation in a beautiful nature. The facilities are very luxurious, equipped with helipads, waterfalls from mountain tops, swimming pools, games rooms, spas, libraries, and VIP suites that are very comfortable. Passengers will feel at home even though the journey is very long and long. This cruise ship is designed with a very grand futuristic, this Palladium cruise ship is owned by billionaire Mikhail Prokhorov who is decorated in luxury at every corner. This ship was named one of the luxurious and beautiful ships. Some ship owners have won awards because Palladium is one of the best ships in the world. This cruise ship is very exclusive and safe so many people want to ride it. 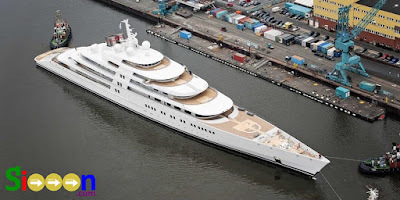 For ball lovers, you will have seen or heard of this privately owned cruise ship, Eclipse is one of the most luxurious and expensive cruise ships in the world belonging to Roman Abramovich. This cruise ship has a concert hall, a cinema, two helicopters, two swimming pools, and one submarine. This luxurious facility is similar to a hotel and makes the Eclipse Cruise Ship one of the most amazing cruise ships. The next cruise ship is not only luxurious, but is nicknamed the largest and longest in the world. Azzam has a complete and very extensive design and facilities. This cruise ship has a sophisticated interior design and luxury in the style of the imperial century. In addition, Azzam has the highest speed, which is more than 30 knots (around 34 mph), which is considered the fastest superyacht in the sea. One of the most perfect cruise ships in the world because it is very large, luxurious and fast. That's the most luxurious cruise ship with a variety of complete facilities in it, traveling by cruise ship becomes more exciting. Although long time it will not be boring if there are complete facilities such as hotels. 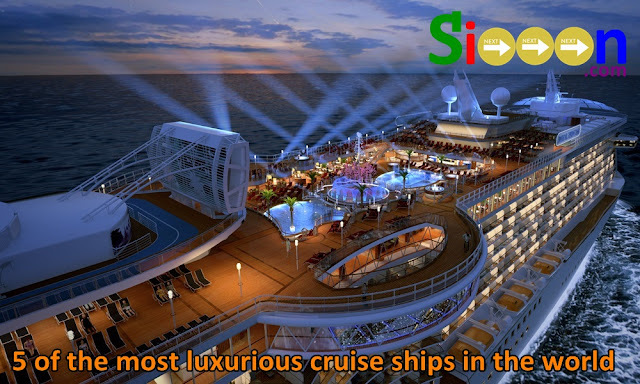 Keyword: Most expensive cruise ship, the most luxurious cruise ship, the most sophisticated cruise ship in the world, the modern cruise ship in the world, the best cruise ship in the world Large luxury and elegant cruise ship, the best cruise ship in the world, the most beautiful cruise ship in the world.